Half mech, half bear, half cat. Is there any possible synergy with spare parts for Druid? This would actually be godmode if it was 6/7 instead of 7/6. Everyone and their mother runs double BGH now because everyone and their mother runs at least Dr. Boom, and handlock is popular, and control warr is popular. This seems pretty good. Almost always guarantees you at least one Spare Part to go with your 6 mana 7/6. High pick in Arena, not so sure about Constructed potential. Yeah, it's not a constructed card for sure. It just doesn't provide enough value in the most common cases to justify the mana cost. Force of Nature is like a 6-attack creature with charge or can even 3-for-1 an aggro deck if it comes to that. Or it's a combo-winning finisher. That kind of flexibility, speed, power and value far surpasses Mech-Bear-Cat unfortunately. This card is much better then the legendary they just came out with. 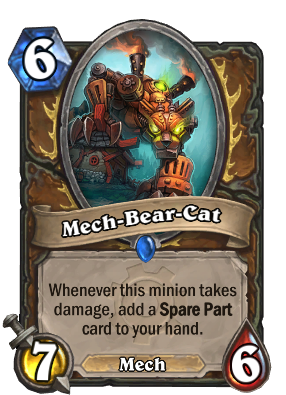 lets just say you only get one spare part you have two copy's of it making it close to as good as Savannah Highmane that might be a bit of an over exaggeration but still a great card. This card is no Savannah Highmane. The two 2/2's are far more valuable than 1 or 2 spare parts. I actually prefer a 6/6 than a 7/6 but you can always use Reversing Switch or Crazed Alchemist to make it a Boulderfist Ogre with a bonus. Besides, only 7 cards, Gorehowl, Fireball, Polymorth, Hex, Big Game Hunter, Assassinate and Shadow Word: Death can kill it right away so still pretty decent. It should be good in Control Druid. Will probably be good with Madder Bomber, Unstable Ghoul and Mad Bomber for draw. The spare parts can be useful to buff say Ironbark Protector or Cenarius. Besides, only 7 cards, Gorehowl, Fireball, Polymorth, Hex, Big Game Hunter, Assassinate and Shadow Word: Death can kill it right away so still pretty decent. So, are you saying this card is immune to Naturalize, Poison Seeds, Siphon Soul, and Twisting Nether, not to mention the numerous cards that can kill this with just a little bit of luck, such as Vaporize, Deadly Shot, and Ragnaros. Then there's the cards that should be able to kill this with just a little bit of help, such as Execute, Patient Assassin, Emperor Cobra, Maexxna (granted no one plays those last 3). Spend 6 of my mana to waste 10 of my opponent's mana (And possibly costing them their lethal) while gaining a Spare Part? I can see a lot of situations where I'd be ok with that. RIP Patient assassin I really like the design behind it.